NYE, James Warren, a Senator from Nevada; born in De Ruyter, Madison County, N.Y., June 10, 1815; attended the common schools and Homer Academy, Homer, N.Y.; studied law in Troy, N.Y.; admitted to the bar and practiced in Madison County, N.Y.; district attorney 1839; served as judge of Madison County 1840-1848; unsuccessful Free-Soiler candidate for election to the Thirtieth Congress in 1846; first president of the Metropolitan Board of Police, New York City 1857-1860; appointed by President Abraham Lincoln in 1861 as Governor of the newly created Nevada Territory; upon the admission of Nevada as a state into the Union in 1864, was elected as a Republican to the United States Senate; took oath of office on February 1, 1865; reelected in 1867, and served until March 3, 1873; unsuccessful candidate for reelection; chairman, Committee on Enrolled Bills (Thirty-ninth Congress), Committee on Revolutionary Claims (Fortieth Congress), Committee on Territories (Forty-first Congress); died in White Plains, Westchester County, N.Y., December 25, 1876; interment in Woodlawn Cemetery, New York City. Dictionary of American Biography; American National Biography; Green, Michael. 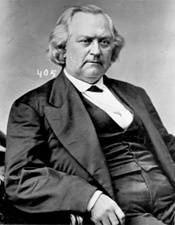 Diehard or Swing Man: Senator James W. Nye and Andrew Johnsons Impeachment and Trial. Nevada Historical Society Quarterly 29 (Fall 1986): 175-91; Samon, Jud Burton. Sagebrush Falstaff: A Biographical Sketch of James Warren Nye. Ph.D. dissertation, University of Maryland, College Park, 1979.